I love cook books, and although I’m addicted to my kindle for fiction books like this simply have to be enjoyed in their traditional print format IMO. That way the reader can dip into sections, browse through looking for inspiration and just enjoy the fantastic pictures this book contains. You can’t do that so well on a kindle, even if its a Fire or tablet, I feel. 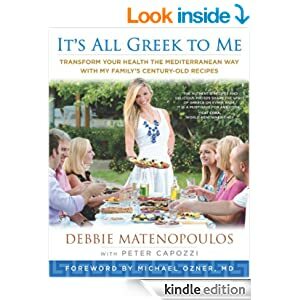 It isn’t just a book of recipes, but more a sample of a way of life, with fabulous photos of Greece, and lots of information on the Greek way of life, especially the Mediterranean way of eating that’s become so revered among dieticians recently. Debbie has adjusted many of the recipes to make them lighter and less calorific. That’s a great help to those of us that try to watch our weight but love to enjoy tasty and interesting meals. I’ve found lots of recipes I want to try here, some for when the family are round and we have a huge clan of three generations around the table. That’s a great way to enjoy food, talk and good company, and of course a good introduction to foreign cuisine that isn’t juts fried rice, noodles or curries!. Most people now are time short when it comes to meals, and turn to ready meals and quick snacks as a main way of eating, but it tells on our health with them being too often full of fats, sugar, salt and preservatives. This book contains lots of recipes that are both healthy, tasty and easy to make. The section on the typical Greek Pantry ingredients means that most recipes can be easily made with ingredients to hand. Nothing is more off-putting to me that to find something I’d love to make, and then discover I’m missing half the essential flavourings and herbs…I improvise of course, but some things need essential flavourings that can’t be swapped. I’m not a planner, but tend to buy meat or fish and then look to my books for inspiration on what to cook. This way I’ll have in my cupboard the things I’ll need. Although many recipes are meat or fish based, vegetarians are not forgotten with many recipes suitable for them. My daughter has been vegetarian for almost 25 years now – she was 9 when she decided no animals or fish would be part of her diet, so I always look for those dishes in a book, and was pleased at how many were here. She’s looked at them too and wants to try some out on her family – they eat meat but also enjoy vegetarian dishes. Stars: Five, a great book, a lovely sample of the Greek way of life that can be enjoyed anywhere. 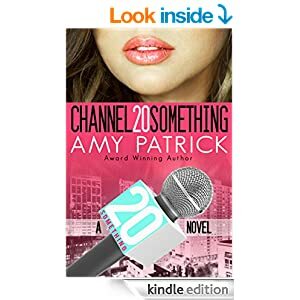 Channel 20 Something, 20 Something Series – Book 1, Amy Patrick. I don’t usually look at covers, but sometimes they catch my eye and they can make a book appealing – or as in this case – offputting for me. I thought this looked a bit flimsy from the cover, a kind of updated 70’s M&B read. Still, the premise sounded intriguing so I requested it…. I was suprised, it was a fun read but with some real life, reality type scenes. Those where we see how other people influence our lives, with incidents that have happened to us or our freinds. It gives the book a realistic feel. Heidi had certainly let the jerk who took her virginity, and then boasted about it online, affect her subsequent years. She thought they were in love, he was a typical good looking jock, out for a good time and willing to say anything to get it. Since turning tail and returning home she’s been in a romance – and I use that term loosely – with Hale. He’s a sweet guy, but there’s no passion between them, no fire and yet her family are convinced they are on the cups of getting engaged. They’re currently on an agreed break, with Heidi hoping Hale will find someone else and let her out without having to upset anyone. She hasn’t told her family, they are very protective, overly so at times, and she knows they think Hale is perfect for her. There’s passion and drama here in situations that are very real. Who hasn’t thought “should I do this?” Who hasn’t let past incidences colour their decisions? I loved Aric, had mixed feelings about Heidi. Her friends – we don’t see that much of them but what we do shows they are loyal and solid to her. They’re subjects in later books, and I’d be happy to read their stories too. Stars: Four, a fun one off read.